We are ramped up and ready to go for Swarm Removal season 2013. Jeff and I are prepared with all our swarm chasing gear, ready to go rescue the bees wherever they may roam. It has been a very cool spring up until now. Most would say a "normal" spring. But with the last few years having been so warm at this time it is strange to have temperatures just now hitting in the 70's. I checked on the bees over the weekend because we had a special visitor come to see the bees. Madison a local homeschool student gave me a call and asked if she could come out and check out the operation. We had a great time ansering all her quesitons and taking a peek at the bees. We made up feed and made sure the ladies all got something sweet to drink. this coming weekend I will clean out the "ponds" and make sure they have adequate water supplies as the days begin to get warmer. 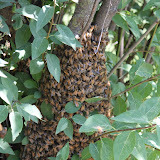 Hopefully we will begin to get lots of swarm calls. 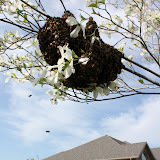 In Southwest Missouri we are just entering Swarm Removal season. But wiht the cool spring it may be a few more weeks before we see them. We have the trucks loaded and are ready to go get them when we do get that first swarm removal call.